A HITCH-hiker meets a missionary in the middle of a tropical island –and that’s the beginning of a beautiful love story. 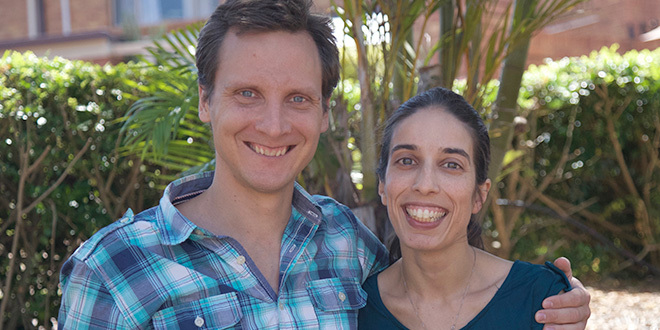 That love story was celebrated as one to last forever when the hitch-hiker from Finland and the missionary, whose Portuguese family hailed from Mozambique, were married at a little country church on the outskirts of Brisbane recently. The odds of their paths ever crossing at all were longer than winning the Saturday-night Gold Lotto. Markus Kurkela had grown up in a small place in Lapland, the northern-most part of Finland. Before he met his bride-to-be he’d spent most of the previous 15 years hitch-hiking around the world. Guida Cabrita, on the other hand, grew up in Australia after her Portuguese parents had migrated from Mozambique during that country’s long civil war. She was halfway through a two-year stint in East Timor as a lay missionary for Palms Australia when she and Markus met. And, if Markus’ travels had gone to plan, it never would’ve happened. “He wasn’t meant to go to Timor,” Guida, a teacher at St Benedict’s Catholic Primary School, North Lakes, said. He was on a long journey from the top of the world to the bottom. In Indonesia, Markus persuaded a captain sailing to Australia to take him with him. “The captain said, ‘I’ll take you to Australia’, but on the way he decided, ‘Haha, let’s go to Timor instead’,” he said. Guida happened to be in downtown Dili when Markus and the captain came ashore. “That was when I found him that day, in front of an ATM,” she said. “He was asking if the ATM was okay to use. “I remember thinking, ‘I don’t normally talk to complete strangers but they looked like they were tired and needed some assistance’. After helping them with the ATM, she pointed them in the direction of a good place for a meal and, because Dili is relatively small for a capital city, that wasn’t the last time their paths crossed. Love struck and changed both their lives. For the permanent hitch-hiker it would mean stopping in one place; for the lay missionary it would also mean a change of direction as well. To marry Guida, Markus would be choosing to live somewhere totally different from his homeland. “I’m from Finland, from the northern part, a small place called Lapland …,” he said. “There’s not many people and it’s very north and it’s a cold place. “In the summer time we can see sun until midnight, and winter time, there’s lots of snow, and it’s dark, and you can see the northern lights. His interest in geography, which he studied at university, sparked an interest to explore the world beyond Finland. From his tiny village Markus “went to the roads and I studied my maps and I thought, ‘This is awesome, you meet all kinds of people, you learn lots of things, languages and about people and everything’”. “(When you hitch-hike) you get taken by homeless people, or rich people, or by big bosses, famous people, all kinds of people,” he said. “You learn a lot, and hitch-hiking is a good adventure. “It’s like life but in a compact package – lots of things happen in a short time period. “It became a lifestyle because I liked it so much. “So just I hitch-hiked around, mostly around Europe, but then also around South America, North America, Africa, all around Asia, even the last points of Siberia – pretty much all the planet. “It has been awesome, and I didn’t feel any pressure that I should stop. “I was happy that way so I wasn’t looking for anything else. As their relationship deepened, Markus began thinking how he could change his lifestyle, and commit to marriage and living in Australia. “I thought, ‘I have seen already pretty much all the planet – you know – I have done it already’,” the 38-year-old said. But that was early on, and they had to give themselves more time. “I was three months in Timor, spending time with Guida and then later I hitch-hiked around Australia, and, once she moved back to Australia, I came here to Ormiston (where Guida and her mother live) and I stayed three months here, but it’s still not enough time to decide such an important decision – to share a life or get married straight away,” Markus said. Markus arrived back in Brisbane in December last year, and they decided to marry. Just as that means a lifestyle change for Markus, his 33-year-old bride is having to rethink some of her choices. Despite the fact that she twice contracted dengue fever during her two years in East Timor as a lay missionary, she was keen to volunteer again. “I was prepared to do Palms missionary work for a long time so, if I hadn’t met Markus – just like he was prepared to keep hitch-hiking – I would probably have, if I didn’t get so sick, would’ve found a way to keep doing that kind of life in some way or form, as best as I could with my health,” Guida said. “I try to help Palms (an aid and development agency with Catholic origins) in a different way. “They have information sessions, so again, when I have more time, I would like to tell other people who are going to be in positions like I was to come and volunteer their time because it’s a great thing. “It’s fun, it’s helpful, it’s ethical as well. “It’s not voluntourism. I did voluntourism in Africa. “You go there for two weeks. I helped to teach, and then the kids would see 26 lots of teachers in a year. “That’s awful. That’s not nice for the children. “It’s very one-sided, making us feel good and not actually helping. “So if we can work … Even two years is not enough, but it’s a good stint of time. Several friends from Palms Australia were at Guida and Markus’ wedding at St Francis Xavier Church, Dayboro, on November 10. Fr Emmanuel Aguiyi, who leads Guida’s home parish of Alexandra Hills Capalaba, officiated, and a Finnish Lutheran pastor did a reading, as Markus is Lutheran. “One of the things that I liked about Markus was that his beliefs about God may not be complicated but his is a very honest kind of faith,” Guida said. “He believes in prayer and communicating with God through prayer. Markus said, “we don’t make so big deal about it – Catholic and Protestant – because, for us, it’s all Christian, and we have more things similar than different”. “So we look for the similarities,” Guida said. And as they prepared to head off on a camping holiday for their honeymoon, Guida was well aware of how hard it would be for Markus giving up hitch-hiking.